Welcome to Wiggly House, home of the Wiggly Jiggly Worm! An exciting new children’s book from debut author Cassandra Kelvin and illustrator Jason Kelvin. Aimed at children of pre-school age, The Wiggly Jiggly Worm tells the story of a worm who dreams of being anything else other than a worm. As he journeys through his day he meets some friends and wishes he were more like them. “Wiggling and jiggling is just too slow”, he complains. However he soon realises that being a worm really is something special. The story teaches children that we should all be proud of who we are! 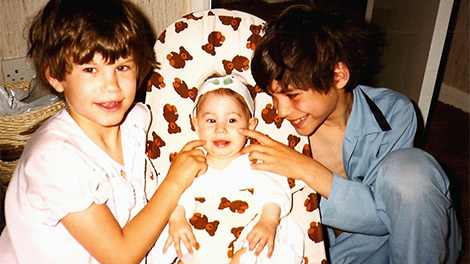 When I was little, I always had my big brother and sister looking out for me…well, most of the time! Now we are grown up, things haven’t changed. With my love of writing, and many children’s stories written but never brought to life, I decided it was time to get my big brother on board. With several years of experience running his own design company, Jason was thrilled to go back to his artistic roots illustrating The Wiggly Jiggly Worm. Having worked together in the past, we knew that we would make a great team! The Wiggly Jiggly Worm is the first story that I have published. My little boy, Zachary, loves it and gave me the inspiration to share it with you. We hope that you enjoy reading it as much as we have enjoyed creating it.